Rising unemployment levels helped push record numbers of homeowners into delinquency or foreclosure during the first quarter, according to industry data released yesterday. Government efforts to cut foreclosure rates have not been enough to offset the impact of the recession on struggling borrowers, the data from the Mortgage Bankers Association showed. And borrowers once considered reliable are now helping drive the foreclosure crisis, which looks likely to extend into next year. "The increase in the foreclosure number is sobering but not unexpected," said Jay Brinkmann, the group's chief economist. Lenders who held off while the Obama administration unveiled its foreclosure prevention program earlier this year are now working their way through a backlog of troubled loans, economists said. And the recession has become a major factor in the foreclosure crisis. For example, for the first time, prime loans, which are traditionally considered safer, represented the largest share of foreclosures during the first quarter, according to the data. Of the loans in foreclosure during the first quarter, 49.8 percent were prime loans and 43.2 percent were subprime. "More than anything else, this points to the impact of the recession and drops in employment on mortgage defaults," Brinkmann said. "Looking forward, it does not appear the level of mortgage defaults will begin to fall until after the employment situation begins to improve." And it may be months before the impact of the Obama administration foreclosure prevention plan, Making Home Affordable, becomes clear, said John Taylor, president of the National Community Reinvestment Coalition. Early intervention in the housing crisis could have forestalled some of the current problems, he said. But "the problem has deepened so badly since then and become compounded by rising unemployment." . The majority of the foreclosure problems remain centered in four states: California, Nevada, Arizona and Florida, where home prices spiked the highest and are now in freefall. They account for 56 percent of the increase in foreclosure starts. Delinquency rates in the Washington region have also risen. In the District, 5.07 percent of loans included in the survey were seriously delinquent or in foreclosure, compared with 2.39 percent a year ago. Locally, the rate was lowest in Virginia where 4.41 percent of loans were in trouble, up from 2.52 percent last year. It was highest in Maryland where 6.49 percent of loans were seriously delinquent or in foreclosure, up from 3.02 percent in the first quarter of 2008. Meanwhile, the market for new homes remains weak. In April, new-home sales were flat, up 0.3 percent compared with March, to an annualized rate of 352,000 sales, according to a Commerce Department report released yesterday. But sales were down 34 percent compared with April 2008. 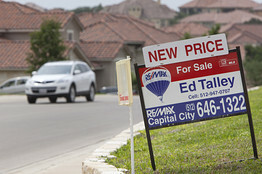 The market is weakest in the West, where sales fell 3.8 percent last month. Sales were unchanged in the Midwest and Northeast. In the South, the region that includes the Washington metro area, sales increased 1.9 percent. As builders compete against a backlog of foreclosed properties on the market, median new home prices fell to $209,700 in April, compared with $246,400 a year ago. It would take 10.1 months to sell all the homes on the market at the current rate, according to the Commerce Department figures. But that is a slight improvement, said David Crowe, chief economist for the National Association of Home Builders. The backlog has been falling as builders curtail production and there are now fewer than 300,000 new homes on the market, the smallest inventory since 2001, said Crowe. The market should begin to show improvement soon, he said. "It won't be a significant, rapid rise, but it will be an increase, which right now, is a whole lot better than a decrease," Crowe said. Home-mortgage rates have surged to their highest level in more than three months, threatening prospects for quick rebounds in the housing market and consumer spending. The average rate for 30-year fixed-rate loans jumped to 5.44% on Thursday, the highest level since early February, according to a survey by HSH Associates, a financial publisher. That was up from 5.29% Wednesday and 5.03% Tuesday. Mortgage rates are being pushed up in part by a steep increase in yields on long-term Treasury bonds, which have a strong influence on the cost of home loans. "The spike in rates has the potential to derail a lot of things," said Mahesh Swaminathan, a mortgage strategist at Credit Suisse Group in New York. Higher rates make it less likely that homeowners will be able to lower their monthly payments by refinancing, which could put a crimp on consumer spending. They could also mean lower earnings for banks, which have profited from increased refinancing. In addition, higher rates are likely to put more downward pressure on home prices and sales. In terms of the burden on home buyers, Credit Suisse estimates that each rise of 0.10 percentage point in mortgage rates is equivalent to a 1% rise in home prices. Home sales have stabilized at low levels in recent months as bargain hunters seek out foreclosed properties. The S&P/Case-Shiller national home-price index in the first quarter was down 19% from a year earlier, largely due to those distressed sales. Some borrowers were stunned by the sudden move in rates. "I about choked," said Kristen Caywood, who had been preparing to lock in a rate this week to refinance the mortgage on her $525,000 home in Avon, Conn., before rates spiked. The 41-year-old graphic designer, who currently has a 6.875% rate, contacted her broker in February after mortgage rates began to drop. She spent months ironing out wrinkles in her mortgage application to boost her chances of getting the lowest rate possible. Now she plans to wait at least a few days in hopes that rates will fall again. Michael Menatian, a mortgage banker in West Hartford, Conn., said he has about 50 clients who have completed their appraisals and are finalizing their applications to refinance but who won't close at current rates because it's not cost effective. 'Catastrophic time' for higher mortgage rates. At J.P. Morgan Chase & Co., mortgage applications started dropping off last Friday as rates started to move upward and dropped off more sharply after Wednesday's rate increase, a spokesman said. Rates are still down from a peak of about 6.5% in late October. They fell considerably starting in late November, when the Federal Reserve announced plans for heavy purchases of mortgage securities. Higher demand for such securities tends to push down rates for consumers. Meanwhile, rising unemployment is fueling a continuing steady increase in mortgage delinquencies and defaults. About 12.1% of first-lien home mortgages in the U.S. were overdue or in the foreclosure process at the end of March, the Mortgage Bankers Association reported. That's the highest ever recorded in the MBA survey and up from 8.1% a year earlier and 11.9% at the end of 2008. People who lose their jobs and find that they owe far more than the current value of their homes are more likely to give up on making payments. "The economy is driving it," said Jay Brinkmann, chief economist at the trade group. About 5.7% of prime fixed-rate loans were overdue or in foreclosure, up from 3.2% a year earlier. Among subprime adjustable-rate loans, the figure jumped to 49% from 37%. The prime category includes many loans that started with minimal monthly payments but exposed borrowers to big increases later. As assets, homes provide only modest annual returns in the long run. There's the usual talk about what the latest Case-Shiller house price data mean for the next short term move in the real estate market. Has housing bottomed? If not, has the rate of decline slowed? And when will we see an upturn? Human nature likes the short term. Which is why so little attention is paid to something that is probably more important, if less urgent: What the latest data show about the long-term of the real estate market. We have just been through the biggest boom in real estate in American history. The subsequent bust surely hasn't finished. Dropping home prices are only one of the factors that keep the annual returns on homes low. Yet look at the numbers. Since 1987, when the Case-Shiller index of 10 major cities begins, it's risen from an index value of 63 to 151. Annual return: Just 4.1% a year. During that period, according to the Bureau of Labor Statistics, consumer prices rose by 3% a year. Net result: Home prices produced a real return of just 1.15% a year over inflation over that time. Critics may point out that the analysis is unfair -- after all, it starts counting near the peak of the 1980s housing boom. Fair enough. Look at the performance since, say, early 1994, when home prices were near a historic trough. Surely someone who bought then has made a bundle. Not necessarily. Since then the ten-city index has risen from a value of 76 to 151. Annual return: 4.7%. Inflation over that period: 2.5%. That's still only a real return of 2.2% a year above inflation. You can often do better on long-term inflation protected government bonds. And real estate often costs 2% or more a year in property taxes, condo fees, maintenance, insurance and the like. Conventional wisdom long held that home ownership was a route to wealth, and the imputed rent -- in other words, the right to live in your home -- was just part of the value you got from it. Under that widespread view, the recent housing bust was simply a temporary, though deep, pothole. Yet for very many people, even over the past 15 or 20 years, the imputed rent may have been all, or nearly all, the real value they actually got from their home. Yes, it's only recent data. And it's only ten cities. But there's some reason to suspect these numbers may, if anything, flatter real estate performance. After all, it's hard to look at the data and figure the bust is now over. And if they fall further, those long-term return figures will fall too. Prices weren't just down 19% over the past year. They fell 2% just between February and March. And it's not the worst-hit markets that worry me the most -- Phoenix is down 53% from its peak, Miami 47%. That smells of capitulation. It's the other markets. New York and Boston are only down 20%. Denver's only down 14%. Overall the ten- and 20-city Case-Shiller indices are merely back to mid-2003 levels. After the biggest boom and bust on record, history suggests things don't stop getting worse until they've gotten a lot worse than that.